1. What is your favorite Feature? - The ratio of everything.. Space, quality, sportiness, functionality, features.. To pinpoint.. The car is a giant Swiss Army knife. 2.what is your fav safety feature? - The fact it's a Honda. I've never researched it but I'm sure Honda hasn't dropped the ball on safety in its class of cars. 3. What is the one feature that you would not give up? - Seat configurations, without the functionality, what would a fit even be..
4. Least favorite (two) - Radio tuning is terrible and for a fun little hatch they could have spent $5 and given us better speakers. Also, do they really think everyone who buys a car like this is under 5'10" tall... A winter jacket and a pair of boots and I feel like I'm packed in, and I'm 6' tall. 1. What is your favorite Feature? Power windows and locks. I never had these before. 2.what is your fav safety feature? Electronic stability control. I know it is mandatory now on all new cars. But in an older car, I once narrowly avoided crashing when I fishtailed after hitting an unexpected patch of snow on a highway ramp. ESC could have prevented that altogether. I think my stepdad's single-car accident, which he thank god walked away from shaken but in one piece, could have been avoided, too. The technology can supposedly prevent a third of automobile fatalities. 3. What is the one feature that you would not give up? I'm dependent on the backup camera now. 1. What is your favorite Feature? 2.what is your fav safety feature? 3. What is the one feature that you would not give up? 1. Other than my answer for number 3, the tardis-like availability of cargo space (though I wish the trunk was as big as in the GD). Also love the color (Aegean Blue FTW! ), apple carplay, the driving experience, the surprisingly decent stereo, and the cool super JDM look. 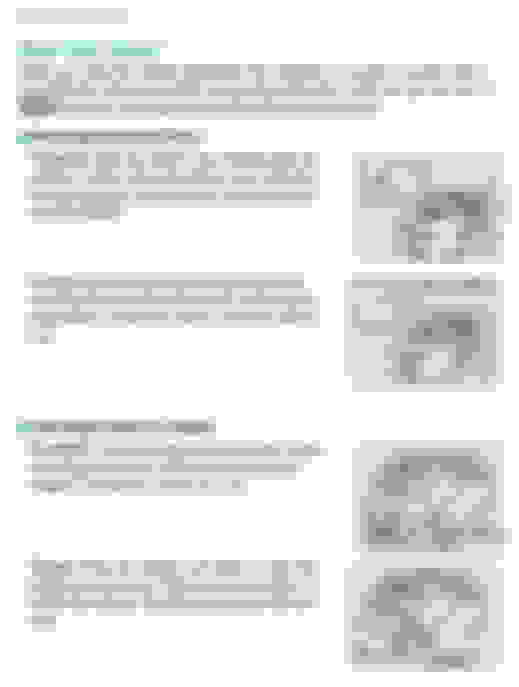 Last edited by Noodle; 10-08-2018 at 08:53 PM. Favorite feature Siri Eyes Free. Although I don’t use it often, it’s very convenient. Runner up favorite Locking all doors by pressing the button inside the rear hatch. Also unlocking in the same way. Things I don’t like, much of the infotainment system. It has a good deal of potential, but falls short. Truly 45+mpg with cruise control set at 62 mph. BTW, the Honda mpg indicator is generous 2-2.5 mph on a tank of gas. I thought you could do that with a 2018. > why the hell won't all the doors unlock while using the drivers door handle smart key access!? To prevent a bad guy from jumping in a passenger door when the driver unlocks the driver's door. This actually happened to a person we know whose car fob unlocked all the doors in her old car. If the passenger and driver have the Fit key fob all the doors will unlock. I will also add that opening the hatch should have an option to unlock all doors. Wife's Mitsubishi does this. It's convenient . Borgus, I think your locks are not working properly and might deserve to be looked at. 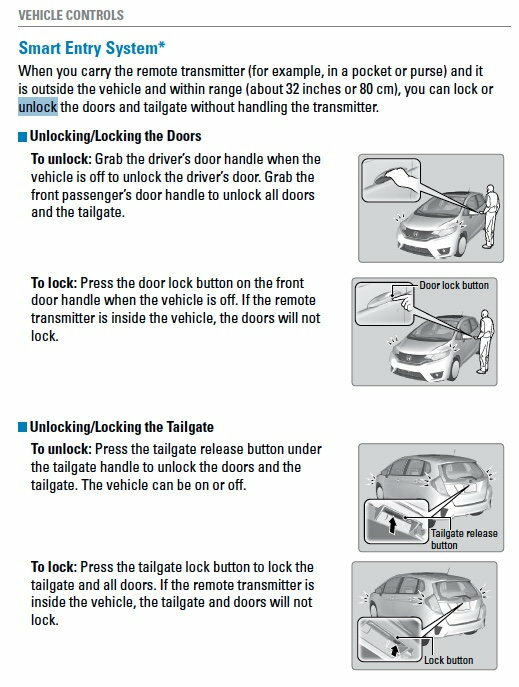 From the manual below it says all the doors and hatch should unlock if the passenger has a fob and opens the door. It also says opening the hatch should open all the doors. Pressing the small button in the hatch unlocks it, and all doors on my 2015 EXL. This button also locks in the same way. I use this feature every day. Favorite feature-hatchback. l haven't had one of those since l got rid of my '81 Datsun 510 in 1998. Mine does this, but only if you lift the hatch and then close it. I tried it leaving the hatch closed and confused the car. Last edited by exl500; 10-16-2018 at 02:12 PM. Quick Reply: What is your favorite feature?